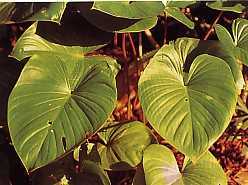 Nampu or (Homalomena occulta )for the botanical name can be found growing wild in the mountains, rivers, lakes, or planted as a medicinal plant and ornamental plants in a somewhat sheltered. Herbaceous plants that have a high longevity of 50-100 cm. Trunked round, not woody,, purple-brown color, and form elongated rhizome. Single leaf, stem 50-60 cm long, fleshy round. Heart-shaped leaves up a knife, pointed tip, base rompang, flat edge, smooth two, pertulangan pinnate, 70-90 cm long, 20-35 cm wide, and dark green. Compound interest and hump-shaped purple leaves grow diketiak, androgynous, 15-30 cm long, and purple stems.medical plant nampu have form fruit, round, small, and red. Long beans, small and brown. Parts of plants used as medicine are the rhizome. Once extracted, clean roots from the root, cud, and the sun to dry. Cut into thin for storage.